M&S Indigo Military Style Wool Jacket Size 16 New. Black with silver to shoulders etc. Brand new very smart never worn. Size UK12 EU40. Oversized double breasted style with brass effect buttons. Tiny hole on right arm - see photo with ruler. 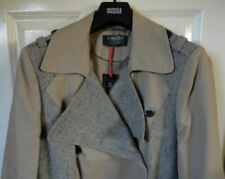 New without tags jacket/ coat size 10. Quality fit and feel. Very dark navy with silver tone buttons including on the cuff detail. Pet free dog free home. 40%wool detailed panels / 100%cotton main. beautiful coat and looks very smart when worn. lovely coat. pre-owned - excellent condition. This M&S Autograph coat has had very little wear and is fully lined. Autograph M&S Moss/khaki Green Military Wool Coat UK10 - more 10/12 as generous fit. Stunning coat. Colour is moss green. Pictures really don’t do it justice. Excellent condition. Features military style with rouched/pleated front. Brass effect buttons. perfect formal coat for races, Cheltenham, Aintree etc Condition is Used. Super stylish coat - fully lined. Underarm to cuff 17". Back length 38". Underarm to underarm 20". 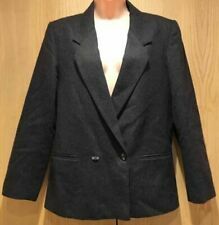 NEW Marks and Spencer M&S Ladies Double Breasted Coat Wool Autograph Grey 10 RPP £119 .. Condition is New with tags. Sleeves are Fur as a Design Detail. Ladies Coat. Lovely Military Style. Overall Length 47.5in. 12.5in Back Comfort Slit. Lovely Classic Collar. Marks and spencer full length navy military style coat. I will be away from the 17/04/19 - 30/04/19. Sorry for any inconvenience caused! Beautiful warm black Marks & Spencer Military “Indigo” jacket with lining throughout and down sleeves. Size 14 worn once lost weight.Silver brocade edge trim to front of jacket and around collar . Epaulettes to shoulders and same to sleeves. Zip fastening covered with poppers. Approximate length 23 inches. reluctant sale . Like new, smoke free home. Any questions please ask. Type: WOOL STYLE SMART ZIP UP JACKET. Colour: BLACK. Label Size: UK 14. Material: POLYESTER MIX. Quality Military Style Pea Coat Jacket. Double breasted - Fastens with 4 large black buttons. Quality Black Ribbed Thick warm wool blend. by Autograph Weekend (Marks & Spencer). with Flattering black Satin Trim to front side panels and rear/side waistline. Beautiful wool mix biker style jacket. I BOUGHT 2 OF THESE JACKETS (LOVED THE STYLE SO MUCH) FROM M&S MARBLE ARCH. BEAUTIFUL QUALITY BRIGHT POPPY RED WOOL JACKET/COAT SIZE 16. BEAUTIFUL RED SATIN LINING. PIT TO PIT - 20" WAIST - 18" LENGTH - 29". Very versatile blazer. Lovely Racing green colour. Shoulder to shoulder - 44cm. LOVELY military style short coat from M&S.NEW. Chest 38". Shoulder to shoulder 16". SIZE. UK 12 EU 38 Australia 12 US 8. M&S light blue jacket with brass buttons size 18 in great condition. Only worn once for a wedding. No pockets, fully lined, made from pure New wool. Selling as no longer wears. Measures from armpit to armpit 22inches across and 29inches long. Please check the measurements before bidding. Any questions please ask. Will be sent UK record post only. Please pay by PayPal within 2days after the auction has finished. Thanks for looking, check out my other items selling. Ladies marks and spencer coat jacket. military look double breasted style buttons. Underarm to Cuff is 17". Schurwolle (Virgin wool). It is Navy with Bottle Green detail, not faded in any way. Navy with Green detail around pockets,cuffs,Inner lining. Gorgeous Military button and braid detail. Zip pockets. Sleekly tailored, with beautiful shoulder pads, pleats and mandarin style collar. Two shallow front flat jetted (no flap) pockets. There are 3 smaller decorative buttons on each cuff. Coat is lined (acetate), all intact apart from the lining in one of the pockets, which has a small hole in it and could be repaired. Product Style: Overcoat. 59% wool, 33% polyester, 3% acrylic, 3% viscose and 2% polyamide. Lined, warm. Filling- 100% polyester. Padded lining. Lining- 100% polyester. Care and composition. Model is wearing size: 8. Very versatile blazer. Lovely Racing green colour. Shoulder to shoulder - 42cm.